Chandigarh : Chandigarh Vigyan Parishad (CVP) was launched today at the premises of Panjab University (PU), Chandigarh. A large number of Chandigarh scientists have joined hands to form CVP as a registered society, which would work for the popularization and dissemination of science education in the tri-city of Chandigarh, Panchkula and Mohali. 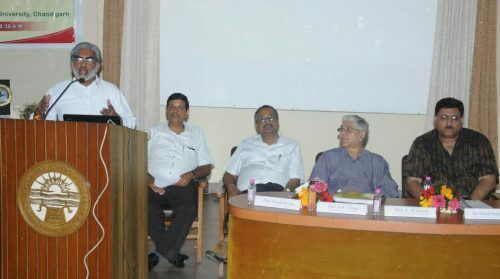 Director General, Council of Scientific & Industrial Research (CSIR) and Secretary, Department of Scientific & Industrial Research (DSIR), Ministry of Science & Technology, Government of India Dr Girish Sahni delivered the inaugural Lecture on Science in India. In his captivating lecture, Dr Sahni elaborated the role of CSIR in transferring science into technology and ultimately to the society at large. Secretary General, Vijnan Bharati (A National Body) Shri A. Jayakumar spoke on the importance of traditional Indian sciences and awareness of the same among children and young scientists. Inaugural function was presided over by PU Vice-Chancellor Prof. A. K Grover. He highlighted and endorsed the need to strengthen the interest of children towards science in Government Schools with the help of learned citizens. He said that CVP can play an important role to achieve the same. President of Chandigarh Vigyan Parishad Prof. S. K. Tomar informed about the aims and objectives of the society. The idea of CVP was incorporated by former PU Vice Chancellor Prof. K N Pathak.Prof. Ranjan Kumar and Dr. Sunita Srivastva are Secretary and Vice president of the Society. Dr. Ashok Kumar and Prof. Sukesh Chander Sharma are Joint Secretary and treasurer.